It is seven p.m., and I take a seat in the H. R. Bright building. On the lecture stage, three men are in traditional Indian dress, with tunics and turbans. They sit cross legged, each with their instrument in front of them. Gourisankar Karmakar sits on the left, playing the tabla. Brajeswar Mukherjee sits in the middle, warming up his voice and swarmandal. Gourab Chatterjee sits on the right, tuning his harmonium. Their position evokes equality and unity. In the ceremonial introduction, the host provides background on each of the performers. 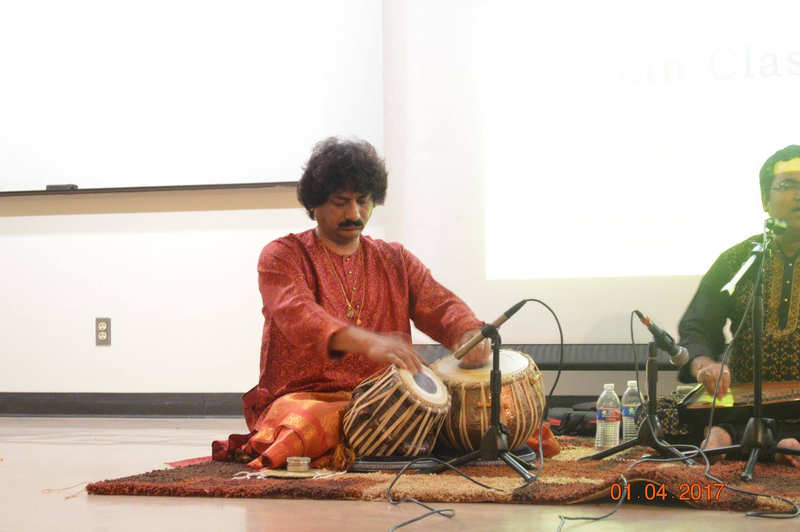 The percussionist, Karmakar, founded the School of Indian Percussion and Music in Austin, Texas. According to SPICMACAY’s Facebook page, “Mr. Mukherjee is a regular artist of All India Radio and Television. Mr. Chatterjee is one of the best young Harmonium accompanists of India and a very versatile artist of Hindustani Music”. At the end of the introduction, the host asks for a blessing from both the Hindu gods and the audience, a requirement in the Hindustani tradition, before a concert can commence. The audience begins to applaud, showing their consent. Then the music begins. At first there are only vocals. The song starts off slowly and calmly. The harmonium begins to buzz and vibrate, matching the voice. They rise and fall together. The tabla enters the song, following Mukherjee’s voice. Karmakar uses the base of his palms against the smooth top of the tabla for the main beat, and the tips of his fingers to accent the sound. Chatterjee enters with the harmonium, sharing a sound similar to that of an accordion. Karamakar, the oldest, is in charge, waving students to come and go. The beat of his tabla also provides the main source of variance now, leading the changes in tempo and tone as the vocals and the harmonium follow. Mukherjee brings out the sound from inside himself, drawing it out and waving it around the room with his hands, casting a spell over the audience as the music reaches the farthest corners and bounces back. The enchanting Hindustani music weaves its way through the crowd. Some people nod to the music, following along, and knowing when to clap. Others sit and make the images from the song up themselves, following the pulse of the tabla, the rise of the vocalist, and the hypnotizing keys of the harmonium. Each musician looks focused, concentrating on their music, and swaying as it washes over them. They shake their heads from side to side. The music gains intensity. There is an unbreaking flow of each instrument together, unstopping, but always dancing together, back and forth, letting one stand out, before taking its own turn, creating a new fusion. Chatterjee’s left hand moves the left front of the harmonium’s gold corner back and forth, while his right hand plays the keys, dancing rapidly across each one. The music slows down, each beat becoming more final. It feels as though it is falling, and about to end. Suddenly the song shifts and the voice begins to pick up, louder than before. Mukherjee seems to be telling a story, drawing it out of his heart with his hands and sending the words and imagery out into the crowd. Sharp staccato sounds break up the flow. Mukherjee begins to do a form of yodeling by changing the intensity of the wavering in his voice. He shows a full, impressive range, from low to high and back again. The harmonium has a small solo, and then the voice and the harmonium begin to answer back and forth, growing in intensity, as the steady drum beat picks up tempo, and the intensity of the song escalates. One grand, pure note rings out of Mukherjee’s voice, before beginning to waver again, evoking emotions of rising tension until the harmonium takes over. There is a steady tabla beat in the background. The harmonium goes faster and softer, like the swift flow of the Ganges River. Finally, Karamakar breaks into a smile. A “ba” and “ga” noise are repeated over and over. The waves of music flow faster and faster, creating an overflowing tide that rushes over the audience. Karamakar closes his eyes and the music pours out, unstoppable. His fingers begin to fly against the surface, and the beat sounds like racing footsteps. He shakes his head and the music flows through his body. He has a semi-solo, but the other instruments never stop. The tabla takes on a dynamic, natural beat rather than the set thumps of American drum stands. The rhythm breaks down. From the side of the table comes the pure note of the cowbell, ringing out and slicing through the fusion. The music is free, and unrestrained. The song seems to be running, faster and faster, until it seems impossible, insane, unstoppable. Throughout the performance it seems like they are beginning to follow a rhythm before it’s turned upside down, creating a surprising incongruity for the listener. Many of the rhythms had a call and response style. Pausing for a few moments, the musicians take a sip of water and tune their instruments. They begin a new song, of pentatonic raga. Karamakar hits his tabla with a silver hammer around the edge of the top circle to tune it. I notice that they never stopped to seek approval from their fans, like some American bands. According to their website, SPICMACAY chapter at Texas A&M University is a non-profit student organization that aims at spreading the traditions, culture and heritage of India, mainly focusing on Indian Classical Music. SPICMACAY stands for the “Society for Promotion of Indian Classical Music and Culture Amongst the Youth” – Texas A&M Chapter. Two or more Indian classical art events are held each semester. The next event, Baithak, will take place this Saturday, April 15th, at the Frank J. Manila Auditorium in the H.R. Bright Building from 5:00 to 7:00 p.m. Baithak is an Indian classical music concert that will feature music and dance performances featuring members of the Aggie community. I would highly encourage anyone interested in hearing a new type of music to attend a SPICMACAY event.